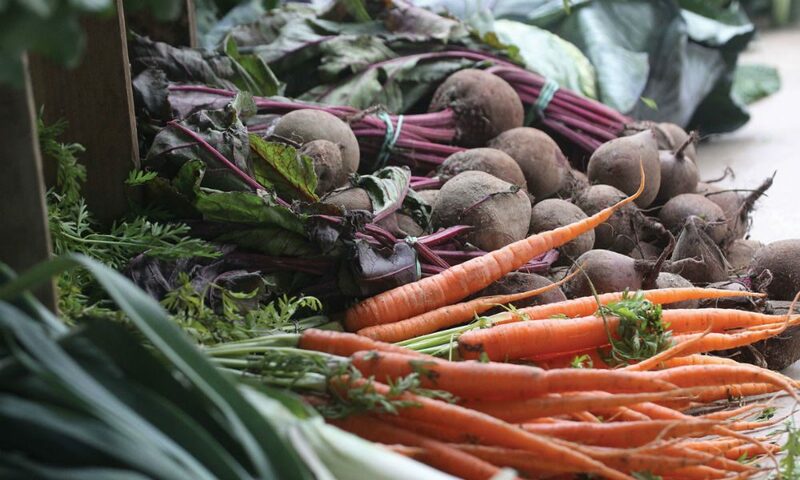 Getting inspired to cook and more at Saratoga Springs' Farmers' Market. Produce from Stannard Farm in Salem at Saratoga Farmers’ Market. Here’s the thing about going to the Saratoga Farmers’ Market as a food writer. It inspires. It makes you want to build a story around what you see. And ultimately, it leads to multiple purchases. The late summer/early fall harvest is plentiful at the farmer’s market, and that bridge from late summer squash varieties to root cellar finds can be tantalizing. Michael Kilpatrick meets with local restaurants early in the year to help plan his growing season. He finds out changes on the menu and feature items, and chefs and owners can call in orders during the season. “If we have extras of a crop—say tomatoes a restaurant can use for canning later in the season—we call them and offer them special pricing,” he explains. It is this kind of symbiotic relationship that makes farm-to-table effective, affordable and community-minded. Kim Klopstock, owner of Lily and the Rose Catering and Fifty South Restaurant in Ballston Spa, is one of his most dedicated customers, but his farm is only one of several local vendors that Klopstock has committed to long-term. “I am heavily involved in the farm-to-table movement,” says Klopstock, and a meal at her restaurant confirms that statement. Foodie and the Scribe, with the help of Scribe’s son, Bennett, a.k.a. “Market Price,” went to Fifty South as fall came into view. The meal was an unwavering local farm showcase, and that is the restaurant’s normal operation. “I could order from Sysco and it is cheaper, but that is not what I am about,” says Klopstock. To start, Fifty South’s charming waitress Courtney brought Spanakopita with cheese from Argyle Cheese Farmer and spinach from Kilpatrick Family Farm adorned with battered squash blossoms. The spinach was delicately sautéed, and the cheese had the tart tanginess of fresh feta. The phyllo was a thin layer encasing the interior without taking over; the squash blossoms a quirky sidekick. Fifty South also serves house-made potato chips and tapenade from SoLively upon arrival, a delicious alternative to bread. Salads were Smoked Duck for Market Price, and Beets and Greens for Scribe. Both salads included candied walnuts and a fan of red beets with a tangy sweet house-made balsamic. “The smoked duck melts in your mouth,” said Market Price. The other salad featured greens from Pleasant Valley Farm owned by the Arnold Family, and chèvre from Argyle Cheese. It had sweet plump cranberry raisins scattered on top of the generous portion. The restaurant had freshly foraged chanterelles, a seasonal find that landed on the daily specials in a few dishes. A chanterelle and shaved Parmesan risotto had a creamy texture. “The nuttiness of risotto was complimented by the chanterelles and parmesan,” said Market Price, the teen gastronome, who also mentioned that mushroom foraging is the national sport of the Czech Republic. The Vegetable Napoleon was served on mashed sweet potatoes and topped with julienned zucchini and a spray of beet greens. There was something vital and healthy about the grilled eggplant, zucchini, Portobello and red peppers, with a touch of mozzarella and sun-dried tomato chèvre to make it indulgent. It was a tower of fresh ingredients for a big appetite: a lacto-ovo vegetarian dish from a menu that also has an unprecedented amount of gluten-free and vegan choices. Also presented were pan-seared scallops from Moby Rick’s on Lewis Waite Farm pork belly. The scallops were light, “fluffy” and buttery, the pork belly a rich foundation. Market Price swore he could discern the meaty layers. Concluding this varied locovore meal were several house-made desserts, many accented with a generous dollop of Battenkill Valley Creamery whipped cream. An espresso bombe, tiramisu and cheesecake with berry compote made up a dessert trio. The berry compote retained the tartness of the berries; the cheesecake flavor and brownie crust were ideal. Also on the table was a blueberry cobbler: warm and accented with a crumbled sweet whole grain crust and whipped cream topping from Battenkill Valley Creamery that could be the cloud upon which one travels to heaven. As we took our last bite, the pianist was playing “Somewhere over the Rainbow,” which is where we were transported by Kim Klopstock’s healthy, locally focused restaurant. Make the trip over the rainbow…or to Fifty South. All of the mentioned farmers have retail stands at the Saratoga Farmers’ Market, open 3-6 p.m. on Wednesdays and 9 a.m.-1 p.m. on Saturday. Fifty South opens for dinner at 4:30 daily; check www.fiftysouth.com for closing times and weekend hours. Klopstock also owns www.lilyandtherose.com. Many more local farmers were featured at the restaurant; the list varies daily.